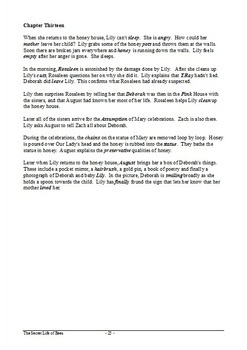 This Word document is a synopsis of the plot of the Secret Life of Bees in 'Fill in the blanks' format. Students demonstrate their understanding of the plot by completing the cloze. 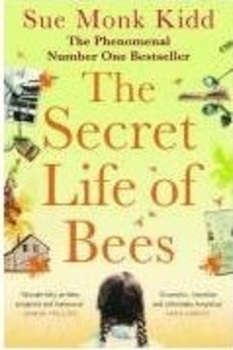 It could be used for assessment or for revision. I usually get students to complete a section at the end of every chapter, instead of asking them to write their own summary. As a specialist teacher for weaker students, I find this approach a very useful support for those who need scaffolding to help them focus on core plot elements. This is an active learning activity that students enjoy. They see it as a fun task. 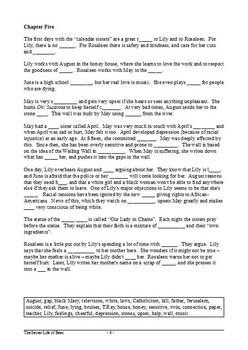 A word bank is provided at the end of each section to assist students. You could redact this to make it more challenging, and to get students to use their own words. The solution (10 pages) is also included. 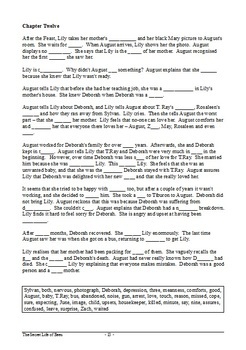 The preview file is a "fill in the blanks" activity for chapter 1, and its solution.